Renting a container for shipping overseas can be a valuable way to expand your business and reach new markets. Because so many businesses profit off of renting containers, shipping business startups are popularizing. After all, your new company’s logistics are a major factor in determining the success or failure of your startup. Whether your business is relocating, buying supplies from overseas or exporting products to a lucrative market, you will need to know the best approach to shipping. This is challenging for any entrepreneur starting out in the overseas markets. There are a wide variety of options available for shipping overseas. You can rent a container for the safest and most cost-effective transportation. In this post, we’ll explain how to rent a container from need analysis to shipment completion. Renting a container to ship supplies or products overseas is one of the most reliable ways to fulfill your company’s logistical needs. Container shipping services transport more than fifty percent of goods shipped internationally. For this reason it remains the gold standard in reliability and accountability. You can conduct business in Spain and guarantee safe shipment arrivals. This is incredibly important when transporting goods or supplies from one port to another. Container shipping involves the least amount of handling, which leads to greater safety for whatever your company needs to ship. You first need to figure out what container rental and shipping companies can service your startup’s shipping needs. Make sure that the company can ship overseas and inquire about their safety procedures to make sure they follow the Convention for Safe Containers. This will help guarantee that whatever you ship will be handled with the utmost care and security. Renting a container offers this advantage, because buying a container outright may require you to secure it yourself. Your new company may not be prepared yet to handle outright ownership and handling of a container. 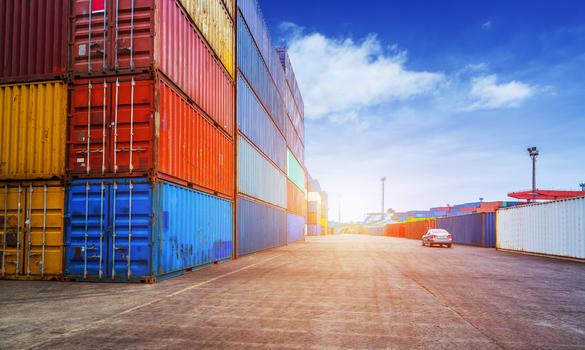 Renting a container allows your startup to ship overseas while still growing. Companies offer many different containers to rent. You will want to choose one that is designed specifically for ocean freight. These can be as simple (and inexpensive) as reinforced wooden crates or as large as a 40-foot steel sea container. Determine what kind of container fits your shipping needs as well as your safety concerns. If you are shipping new equipment, you will need a container that will protect the machinery. Don’t be afraid to speak with the company from which you are renting the container to determine a size and material that will fit your company’s needs. Figuring out the type of container you need well in advance will prevent unexpected setbacks. Renting the wrong container can be a waste of money, so plan ahead. Renting will require a little extra documentation and effort on your part, but it’s worth it. Part of what makes container shipping so reliable is the extensive care that goes into handling whatever it is you need to ship. Documentation is required at almost every step of the way, and your startup will be required to furnish a detailed inventory of what you will be shipping inside the container. Have contact information on hand for every aspect of the shipping process. Include the names and contacts of any movers or companies who will be the intended recipients of your products overseas. You may also need to provide other documents, such as proof of insurance. Having this all ready in advance will make it that much easier to proceed through the rental process. As a final option for your startup, you may want to consider using door-to-door services for your shipping. These companies will rent a container to you and guarantee pickup, transportation, and delivery all in one package. This has the advantage of freeing up time and resources on your end. It tends, however, to be more expensive. This can be a major benefit for small startups that don’t have the time or staff to handle multiple contacts and business partners for each step of the way. It can also be of benefit to new companies that only need to rent and ship a container once for a specific purpose. Evaluate your startup’s needs and determine whether or not door-to-door service is good for your company. If your startup is looking to ship products overseas, renting a shipping container can save a huge amount of time and effort. Researching your options and deciding what kind of container you need will pay off in potential savings and reduced risk. Make sure you are on the same page as the company you are renting from to ensure that there are no unexpected headaches. Going into this process with all of your documentation ready to go will make it easier for both you and the company you are renting from. Finally, plan for the future and determine whether your startup is capable of affording door-to-door and other full-service rental and shipping options. Doing these things will allow your startup to handle its logistical needs as it continues to grow.